I opened the observatory well in advance of the transit time to get ready for it. While waiting I did some test solar observing using my new Baader 8-24mm zoom eyepiece and William Optics Binoviewers with an Orion full-aperture solar filter on the 8" LX200-ACF. I'll report on the results on my upcoming product reviews. 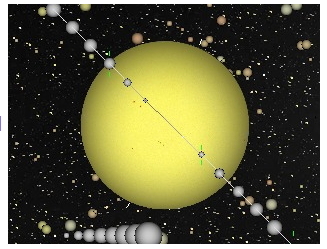 1446 MST: I began preparations for the ISS-Sun transit. Mounted the D7000 DSLR at prime focus of the 8" telescope. Did a test image to verify exposure settings. 1457 MST: was now ready for the transit. While waiting I did some accessory re-arranging in the observatory to make room for my new accessories. Seeing was pretty bad during the transit, partly due to the strong breezes and partly due to the sun's low altitude in the sky. 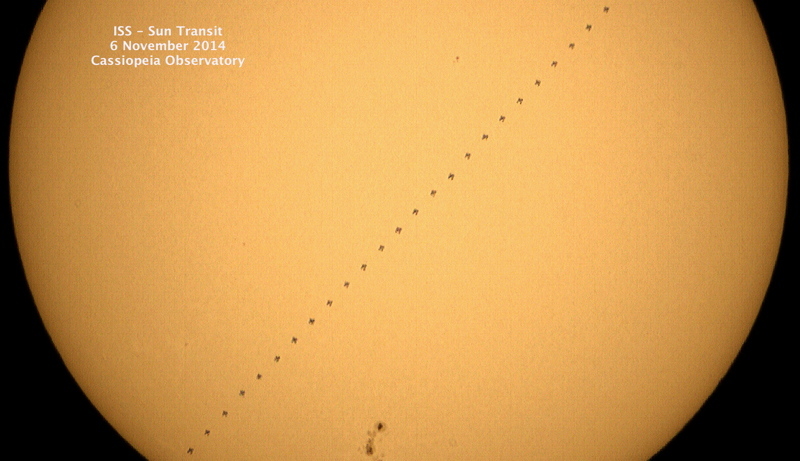 The next image a composite of all the frames showing the transit. The ISS moved from the top (west) to the bottom (east) in 1.3 seconds. Click on the image to see a larger version (1.6 MB).